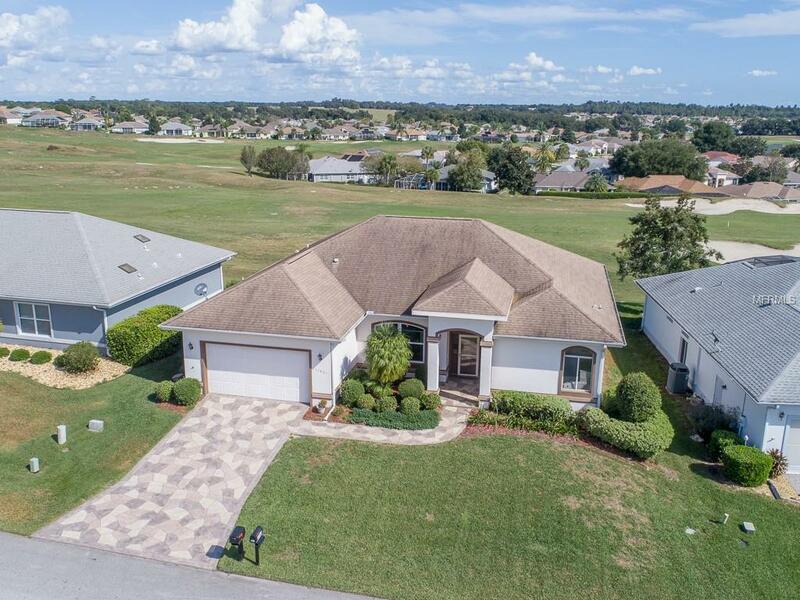 STONECREST ADULT GOLF COMMUNITY WITH PRIVATE ROADS, GATED COMMUNITY, ALL THE AMENITIES, 4 POOLS, AND 2 MILES FROM THE VILLAGES WITH GOLF CART ACCESS. THIS CONCRETE BLOCK AND STUCCO HOME IS ON THE 18TH CHAMPIONSHIP FAIRWAY. ALL 10 FOOT CEILINGS (NO POPCORN) AND LOVELY VIEWS OF GOLF COURSE THROUGH HUGE PALATIAL WINDOWS AND 8' SLIDING GLASS DOORS. THIS HOME IS PRICED TO MOVE. CLEAN AS A WHISTLE AND FRESHLY PAINTED ON THE INSIDE, INCLUDING THE GARAGE. YOU WILL WANT TO UPDATE SOME OF THE FEATURES IN THIS HOME, HOWEVER, THAT IS WHY IT IS PRICED THE WAY IT IS! LOCATION LOCATION LOCATION. SPLIT BEDROOM PLAN, OPEN FLOOR CONCEPT WITH AN OPEN KITCHEN THAT VIEWS THE FAMILY ROOM, LIVING ROOM, DINING ROOM AND THE GOLF COURSE. A/C W/HEAT PUMP IS 4 YEARS OLD. ROOF IS 6 YEARS OLD. GREAT BONES AND GREAT PRICE WITH EXPANDED SQUARE FOOTAGE THAT WILL BLOW YOUR MIND! A MUST SEE!